"Hummingbird Magic Address Labels" product is already in your cart. Bird lovers everywhere will be thrilled with these gorgeous Hummingbird Magic Address Labels that look like pastel water colors. In serene and subdued colors that will capture your eye, these four renderings of hummingbirds enjoying their life will delight you. A spray of rosy red flowers has a single bird hovering under the blossoms, a beautiful green and rose flowering branch has a trio of birds flitting around, purple flowers on a sage green bouquet has its own bird and more purple flowers with rose background also have a pair vying for the same flower. 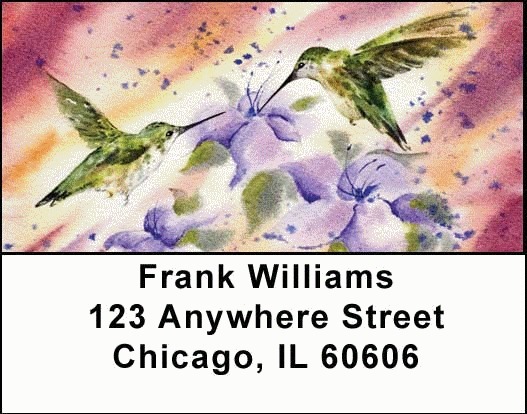 These wonderful Hummingbird Magic Address Labels bring serenity and beauty to everyoneï¿½s world.